Oh WOW. This book, seriously, is amazing. Starcrossed by Josephine Angelini is so exciting and addictive reading that I stormed through the nearly 500 pages as quickly as is humanly possible. I was just so desperate to keep reading and find out what happens in the story and with these characters that I grew to love so much. When I picked up Starcrossed I was really in the need for a romantic story to make me feel strongly and to just sweep me away, and this book did not disappoint me in that. It is was everything I could have wanted and more. With romance and long-standing feuds. It has family secrets and betrayal, friendships and super-powers. Like I said, this book? It's amazing. Plus the whole setting of Nantucket really added to the atmosphere with the stormy weather. I feel as though retellings of Greek mythology is becoming all the rage nowadays, and I think for good reason. There's so much passion and adventure and thrilling stories from Greek mythology that how it can not be hugely fascinating to revisit? 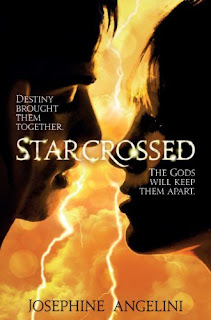 Such as the case with Starcrossed, as Helen and Lucas are modern reincarnations of characters from Greek myths, bound to each other and to a fate that is already been set aside for them. But will knowing what Fate has in store for them change the decisions of these two love-birds, as they fight against the chemistry and strong emotions that they have for each other? AHHHHHH! It's all very exciting. Together with the swoon-worthy aspects of the romance, and the awesome action and fighting between demi-gods, there is also some really great characters here. I especially love Lucas and his entire family. Unlike Helen, the Delos family have grown up knowing what they are and what is in store for them and the responsibilities that each bears makes for some really interesting reading. Honestly, I'm so excited about this book and seeing what comes next in the series. You all must go and read it! Highly recommended from me. It was brilliant wasn't it. I love this book! Sounds great, I really like these Greek retellings that are popping up. Jenni - I do as well! Leanna - It was wonderfu, wasn't it? Cliona - You definitely should! For the first 50 or so pages I thought this was going to be just like Twilight. Initially there are lots of similarities between Helen Hamilton and Bella. For instance they both are living with their dad and both feel a bit out of it at high school. However, from about page 50 onwards this story takes on a life of it’s own. With demigods, Greek mythology, furies, the underworld. It is a fast paced page turner. And Lucas Delos is the perfect heart throb. I hope there is a sequel coming soon because the ending left me wanting so much more! I read the book and loved it too! Josephine Angelini is a fabulous writer as ‘STARCROSSED’ is one of those books that people just HAVE to read. Forget brooding vampires – they’re just so last year! Bring on the Demigods! They’ve got “strength, speed, agility, acute hearing and eyesight, beauty, rapid healing and intelligence” and on top of that, some of them even have rare special powers like flying! I don’t think anyone can top that! Lucas Delos and Helen Hamilton fell in love when they were practically destined to loathe one another and this unique love somehow binds them together because every minute they are apart, it’s like torture. Josephine Angelini really makes the reader feel what the characters are feeling which I think is a unique ability few writers possess. By the end of the book, you will no doubt crave for the next book – just like did and still do! At first, I definitely saw an awful lot of similarities between Starcrossed and Twilight, but by the final five chapters or so, Starcrossed streaked ahead by far. It's the only 500+ page book that I've read in under 24 hours and I'm a HUGE Potter fan!